Home > What Makes PACE® Different? In PACE our professional caregivers get to know you. 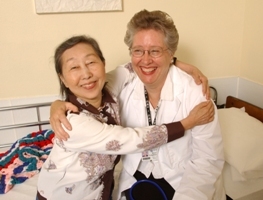 PACE organizations provide care and services in the home, the community, and the PACE center. They have contracts with many specialists and other providers in the community to make sure that you get the care you need. Many PACE participants get most of their care from staff employed by the PACE organization in the PACE center. PACE centers meet State and Federal safety requirements and include adult day programs, medical clinics, activities, and occupational and physical therapy facilities. PACE organizations support family members and other caregivers with caregiving training, support groups, and respite care to help families keep their loved ones in the community. PACE programs are sponsored by health care providers in your community. This means your PACE doctor and other care providers are also the people who work with you to make decisions about your care. No higher authorities will overrule what you, your doctor, and other care providers agree is best for you. If you disagree with your team of healthcare professionals about your care plan, you have the right to file an appeal. The focus of every PACE organization is to help you live in the community for as long as possible. To meet this goal, PACE organizations focus on preventive care. Although all people enrolled in PACE are eligible for nursing home care, only 7 percent live in nursing homes. PACE uses Medicare and Medicaid funds to cover all of your medically-necessary care and services. You can have either Medicare or Medicaid or both to join PACE.